Zahara thought it was just another vacation. 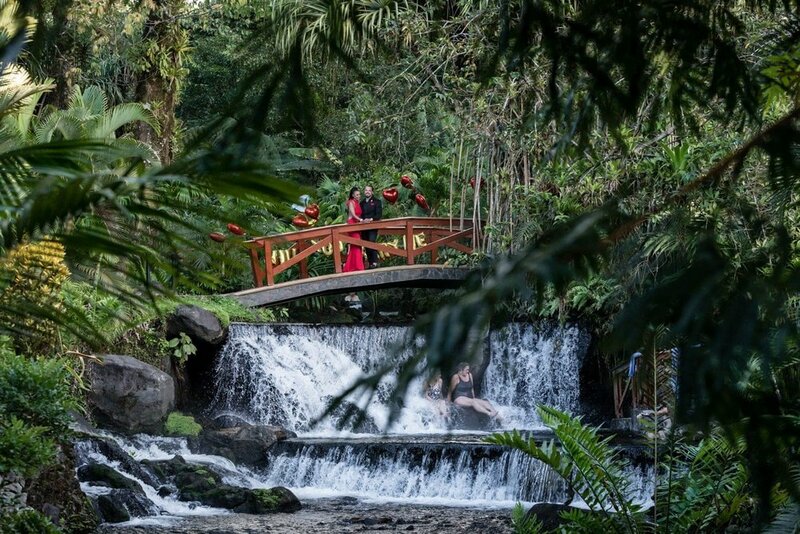 Little did she know, Nico had spent months planning a most romantic engagement - a magnificent engagement ring, a fairytale red bridge, and a romantic private dinner on Valentine's Day at Tabacón in La Fortuna, Costa Rica. On a picturesque red bridge, covered with red rose petals and adorned with red balloons, that traversed a waterfall over which flowed a river fed by volcanic thermal springs, Nico took a knightly knee. 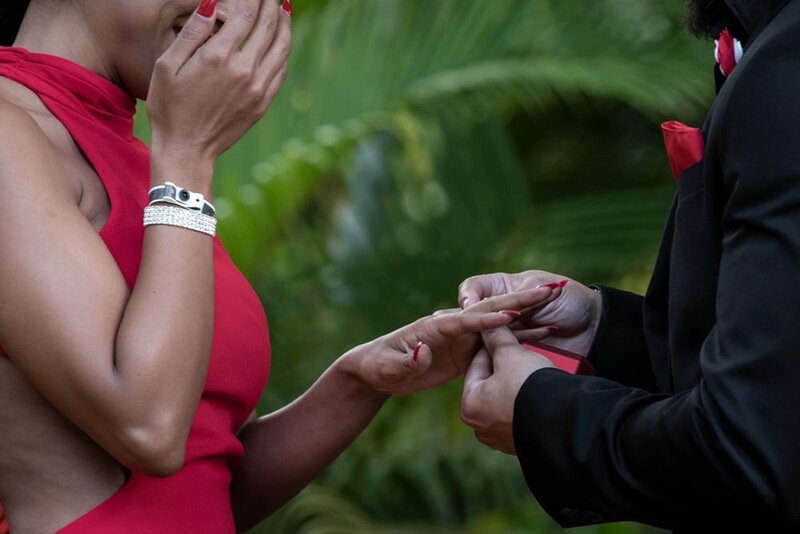 Zahara, overtaken by emotion as Nico proposed, shed tears and broke into a wide smile as Nico looked up at her, opened a little black box hiding a brilliant, sparkling engagement ring, and Zahara to marry him. Without any hesitation whatsoever, she said yes, and she an Nico stayed in the moment in a loving embrace as we got some great photos of them and the scenery. Afterwards, we found two other great locations for engagement photos where Zahara and Nico could be more themselves as a couple and enjoy each other. Not far from the red bridge, there was a niche next to a thermal-fed spring. It was surrounded by tropical plants and rainforest and there was an opening that allowed the late afternoon light to fall on Zahara and Nico, giving us great natural lighting while we captured the love between the just engaged couple. At Tabacon's Shangri-La Gardens, there was an open area tucked away in the garden ensconced by rainforest that had little couch huts - a type of couch inside of a wicker hut. 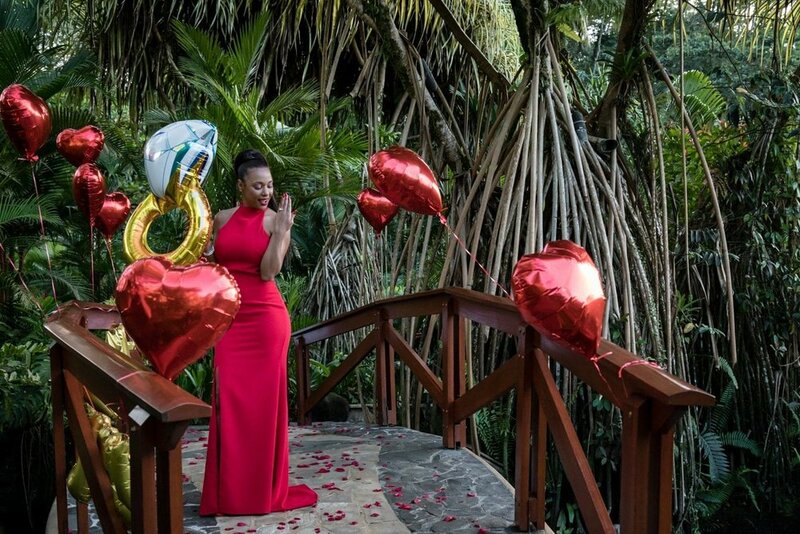 Aside from the photos of Zahara and Nico getting engaged, we just love these photos. We chose the hut that had the best background and lighting, situated them in the best spot, and just let them be. What a beautiful, loving couple! Their personalities and connection really came out in the photos. As if the fairytale engagement on a red bridge covered with rose petals in a rainforest above a waterfall in the shadow of a volcano was not enough, Nico planned a remarkable private romantic dinner in a rainforest bungalow decorated with more rose petals scattered about the wooden floor, a heart made of red rose petals with a candle in it next to a mat covered with photos of them on other adventures. Zahara was again taken aback. 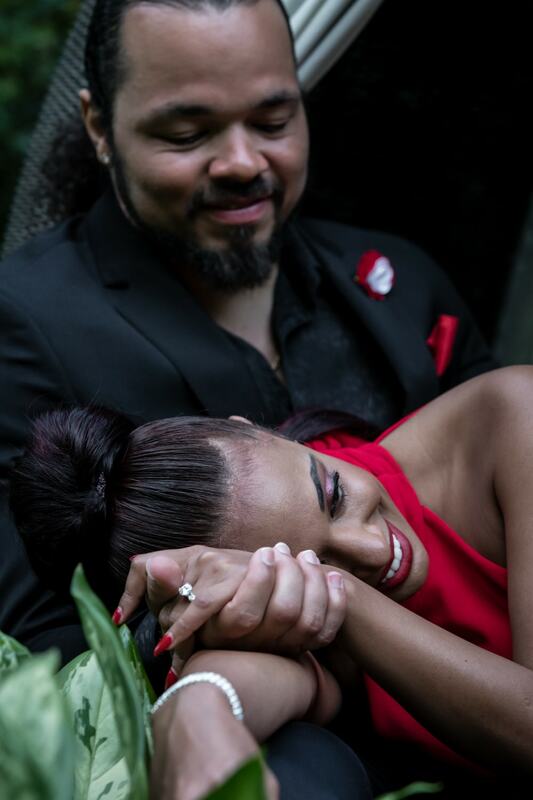 It was the perfect ending to a fairytale engagement in a magical place for two lovers.